The cold week last week finally showed up in the storage report, as EIA reported that working gas in storage was down 287 Bcf to 2.53 Tcf. The withdrawal was 84% greater than last year (-156 Bcf) and 81% higher than the five year average (-159 Bcf). Last week's withdrawal was 2 Bcf higher than the monster withdrawal reported on December 19, 2013, which I believe was the largest on record. 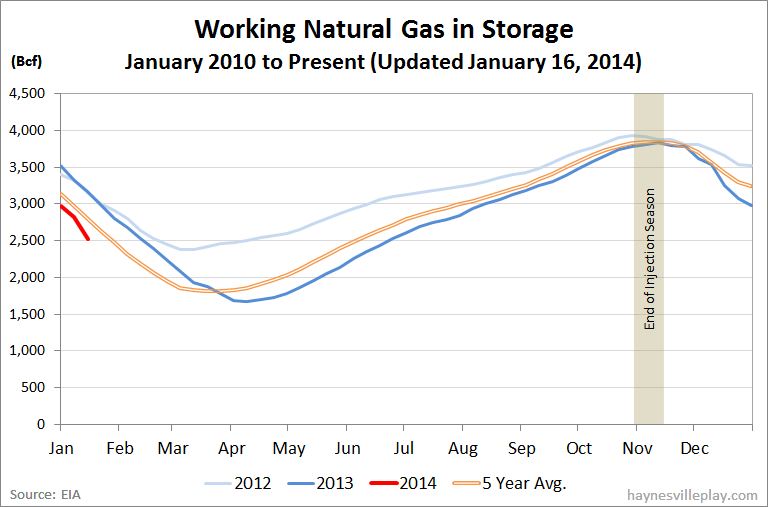 The current storage level is 20.7% below last year (3.189 Tcf) and 14.9% below the five year average (2.973 Tcf). Temperatures last week in the Lower 48 averaged 25.9 degrees, which was 9.6 degrees cooler than last year and 7.4 degrees cooler than average. No surprise there!